If you are out there to buy yourself a pole saw and unable to find one that gives you the best value for your money, then today we bring you a list of the 7 top pole saws in 2017 to help you narrow-down your search for the best pole saw. Design that is easy to hold and cut branches and limbs without needing a ladder. The 2-cycle 25cc engine fitted in this pole saw features enough power for even the toughest cutting task. The chain and bar is 8-inch long and the extension pole has a length of 7-feet enabling you to reach a max height of 12-feet. Automated oiling mechanism to keep the chain lubricated always. The Remingtom RM 2599 Maverick Gas Pole Saw is sold for $159.99 via Amazon.com. Can be easily connected to trimmers from other manufacturers like Remingtom and Craftsman with attachment capability. The pole is 7-feet long which can help you reach up to 12-feet max. The TrimmerPlus PS720 is up on Amazon.com with a price tag of $86.48. 5Amp powered motor that be used to cut branches with thickness up to 7.5-inches. The pole is 8.7-feet long and can help you gain an overhead reach of 15-feet. The Oregon cutting bar is of 8-inches. The SunJoe SWJ800E Electric Pole Saw has a price tag of $79.57 on Amazon.com. The extension of the pole can let you reach up to 14-feet overhead. 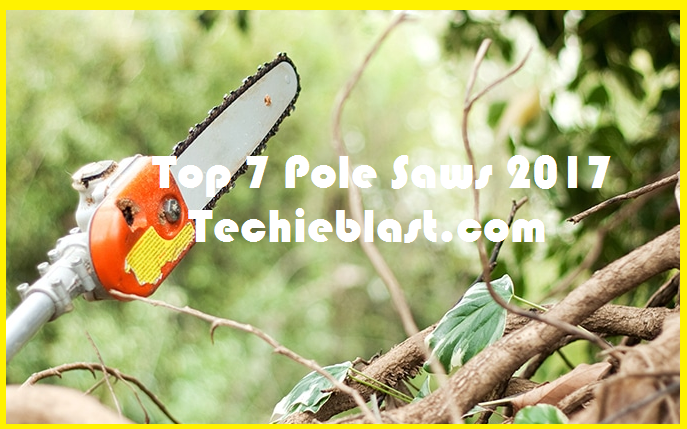 The pole saw is powered by a 20V Li-ion battery. The chain and cutting bar is of 8-inches and offers a cutting diameter of maximum 6-inches. Charger that is energy-star rated. The Black+Decker LPP120 Li-ion Pole Saw is available on Amazon.com for $98.99. A steel pruner is included that is made of steel along with a double-grind saw of 12-inches. The Pruner can help to cut branches with a maximum thickness of 1-inch. Specially coated for low friction. Extendable pole is made out of fiberglass. The Fiskars 7 Pole Saw is priced at $40.96 on Amazon.com. The WORX WG309 Electric Pole Saw features a patented technology to set the tension on the extended bar and chain automatically. Extension pole with a max length of 8-feet. The WORX WG309 Electric Pole Saw features a price tag of $94.70 on Amazon.com. The package includes a special case for the GreenWorks 20192 Corded Pole Saw. The electric motor has a power rating of 6.5Amps. The Oregon bar is of 8-inches. Tension system for the chain can be easily adjusted in case you need to tighten the chain. Auto-oiling feature to oil the chain and bar for maximum life and durability. 3-pieced shaft is made of aluminum and has a maximum extension length of 8-feet. The GreenWorks 20192 Corded Pole Saw can be bought from Amazon.com for just $78.66.